In this article, one of our Zone Leaders examines results from the 2017 Developer Survey by Stack Overflow and some of the results may surprise you. 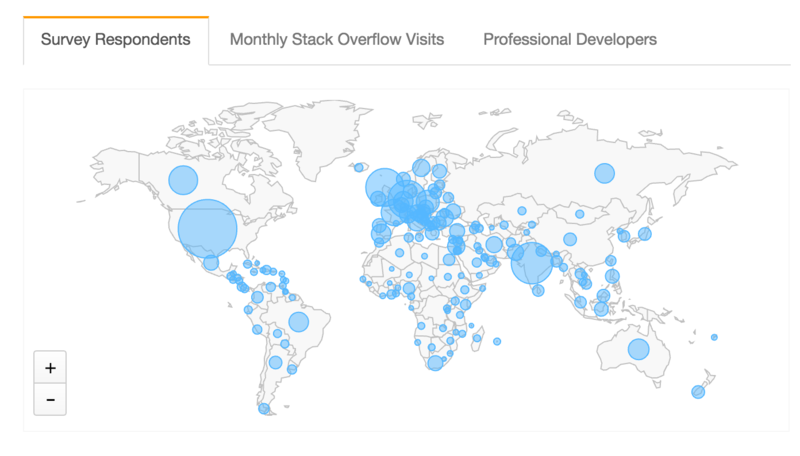 For the seventh year in a row, Stack Overflow hosted their annual survey in January. The 2017 survey yielded the largest number of respondents, providing feedback from 64,000 developers located from all around the globe. The entire results are quite insightful and I wanted to highlight a few sections of the results which I found interesting. I certainly recommend reviewing the entire results when time allows. Nearly 43,000 respondents provided their educational background. Those results concluded that 75% of the developers had a computer-related concentration for their secondary education. This means that 1/4 of developers have some other primary area of study - noting natural science, non-computer related engineering or math as the most popular. These results should be a positive indicator for those interested in an application development career, yet have a degree in another concentration. In my personal experience, those who have become developers, and obtained a business-related degree, have typically fared well with being able to understand non-engineering aspects of the needs reported by customers. In the frameworks, libraries, and other technologies category, Node.js was ranked the most popular - obtaining 47.1% of the votes. AngularJS (44.3%) and the .NET Core (33.4%) framework ranked second and third, respectively. I was surprised .NET ranked higher than React (19.5%), but this might be due to the high popularity of .NET in the European regions. It could also be due to the fact that the survey was held just as React began to gain some momentum among developers. This will be an area to watch during the 2018 survey. I found the most loved, wanted, and dreaded languages category very interesting. After all, programmers tend to be opinionated, especially in regards to the languages that they support - which might have some design flaws or challenges. Merely mentioning Visual Basic 6 (88.3%), VBA (80.4%) and CoffeeScript (79.2%) causes a majority of developers to cringe. I was really shocked to see Visual Basic 6 make this list - since it has been quite some time since I have worked with the Microsoft offering. In fact, years ago I had to remove VB6 from my LinkedIn skills section to make way for more current skills. I am sure the same legacy-based frustrations exist with VBA - which I always considered a subset of Visual Basic. From what I have heard on CoffeeScript, at times it can be difficult to understand exactly what the code will actually do - especially when leaving out optional parenthesis, curly brackets, and commas. I would certainly dread working in any of these languages. Most believe developers have been programming their entire career. However, only 11.3% received their first programming job after learning how to program and 36.9% learned to program one to four years before getting their first programming job. My take - it is never too late to follow your passion to program. A mere 13.1% of respondents are actively seeking a new job, but 75.2% are interested in hearing about new opportunities. My take - those 75% are always keeping their options open - because of an industry that thrives on constant change. When asking about job benefits, 53.3% preferred remote work options - with 63.9% working remotely at least one day a month and 11.1% working remote almost all the time. My take - organizations need to realize that developers prefer to work in isolation/remotely and are likely more productive in these instances. The majority felt they were underpaid - especially those in government and non-profit positions. My take - this may be a reason why 75.2% are interested in hearing about new job opportunities. I only recently discovered Stack Overflow's annual survey. Having a survey focused on application developers, motivated to be open and honest - with 64,000 participants around the planet - is simply amazing. I am planning to provide a similar summary after the 2018 survey is completed. How do your thoughts line up with these survey results? What Is the Programming Language of the Future? What Programming Language Should You Master Next?